Sente-se no sofá e desfrute da paz no apartamento, ou aproveite a varanda! 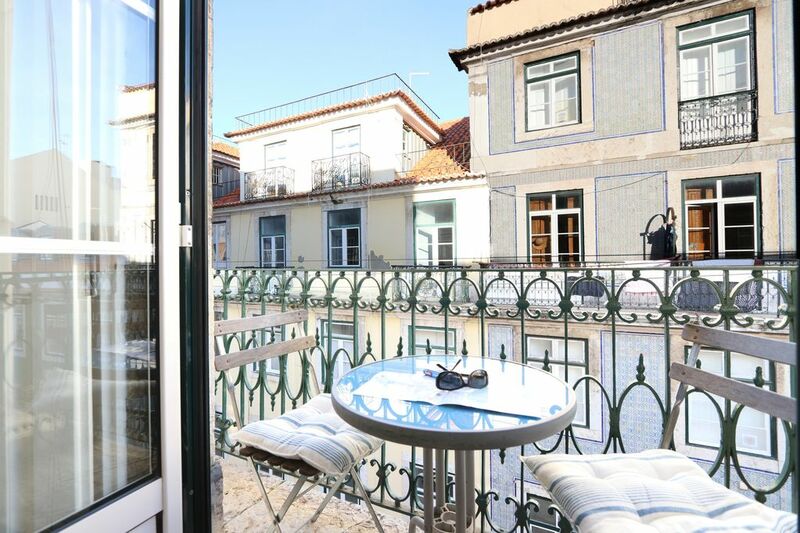 Sente-se no sofá e disfrute, ou aproveite a varanda para sentir a Lisboa histórica! Fantástico apartamento em ambiente histórico em localização privilegiada: a Baixa de Lisboa. ATENÇÃO: o apartamento fica num 4º andar sem elevador. O apartamento tem varanda para o centro histórico e é confortável para até 3 pessoas. Tem uma sala de estar, 1 quarto interior com cama de casal, um quarto com cama individual, uma casa de banho com banheira e uma cozinha totalmente equipada. Está equipado com acesso internet de alta velocidade gratuito (wi-fi), TV por cabo, aquecedores e ar condicionado. De lá pode visitar, a pé, bairros históricos como Chiado, Bairro Alto, Alfama e Castelo. O apartamento está num bairro muito calmo e silencioso à noite. A morada é Rua dos Correeiros, que fica entre as ruas principais da Baixa: Rua Augusta, Rossio e Terreiro do Paço. Saiba mais sobre a Olivier C.
The apartment is in a very central location and easy to get everywhere. It’s small but clean and looks exactly like the pictures shown. Olivier provides plenty of information, good communication and the arrangements from the airport and luggage storage were perfect. Our one area of disappointment related to a lack of supplies. We had to buy our own laundry soap and resupply toilet paper. That should have been provided. Also, the cleaning service should clear out the refrigerator as there was rotten cheese in there. Un superbe petit appartement et très bien situé ! Ce charmant petit cocon est idéalement situé dans Lisbonne pour visiter la ville à pied ou avec l’aide des multiples transports. Son 4eme étage offre forcément un balcon avec une vue agréable. Nous avons passé 4 jours à découvrir les différents quartiers, à marcher au hasard des rues pour découvrir le street art, l’architecture et la cuisine de Lisbonne. Une très jolie parenthèse ! Par ailleurs Olivier est un hôte attentif et propose un service de qualité avec notamment la prise en charge à l’aéroport si vous le souhaitez. We stayed 5 nights and found the apartment was well equipped, very clean with good wi-fi and AC plus was quiet with it being on a no traffic road. Its location is excellent as you really do walk out the door and are in the middle of the older town with the many of the main sights, great shopping and lots of places to eat just a few minutes away. The apartment host was very good - available to easily contact and responsive to requests - plus the transfer organised from and to the airport was great. Simply put we have stayed at various apartments in European cities and would highly recommend this one for Lisbon. Great location and comfortable stay. Don't be afraid of the stairs - it is great exercise, but do recognize you will need to carry your luggage up them. Olivier was excellent - so responsive and very helpful! He even arranged our pick-up from the airport (Evo from Hopin drivers was fantastic). The place is cosy and snug, but we really enjoyed it and couldn't ask for a better location (between two of the best metro stations). Fab cosy appartment in a perfect place to easily explore the city. Can't fault the appartment, cosy, immaculately clean and very well equipped with everything you could need. You do need to be quite fit however, as there are many steps upto the appartment, but well worth it when you get up there!! The owner Olivier has been incredibly helpful with speedy responses to any questions asked and also provided really useful information on everything from how to use all the appliances in the appartment, where to eat, drink, visit and of course where to buy the best custard tarts!! Two metro stations within a few minutes walk, trams & buses minutes away, fantastic location. We loved our stay & will definately be back. Lovely apartment in the Center of it all! Very beautiful, spacious apartment. I wish we had more time to spend here! As estações de metro Baixa-Chiado e Rossio estão a menos de 1 minuto a pé. A zona é ideal, entre uma seleção de lojas, restaurantes e cafés atraentes, muitas paradas de ônibus/autocarros, bonde/elétrico e a estação de trem/comboio. A famosa vida noturna de Lisboa, com seu labirinto de bares e clubes no Bairro Alto e Cais do Sodré fica a apenas 5 minutos a pé. As lindas praias de Cascais ficam a apenas 20 minutos de comboio.